Canned Motor Pumps | Pumps and Systems | Products and Services | NIKKISO CO., LTD.
Sealless pumps with leak-proof construction with the pump and motor integrated into one housing. The pump is not connected to the motor causing leakage. The pump and motor are connected and sealed to prevent leakage. 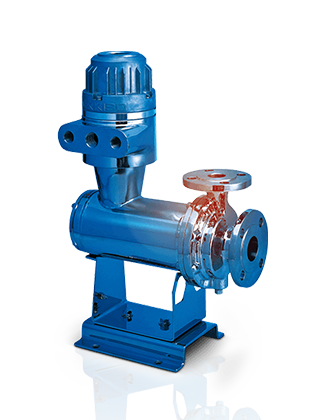 The pumps can meet increased safety and special explosion-proof requirements. The pumps are of a construction corresponding to the IP protection level. *1 HASTELLOY® is a registered trademark of Haynes International, Inc.
With strong engineering response capability and reliability based on long years of proven accomplishments and long service life, the pumps are used in a wide variety of fields such as petrochemical, petroleum refinery, chemicals, electric power, food, semiconductor and air conditioning industries. These pumps are smaller sized pumps which have the same performance characteristics as the Standard Non-Seal® Pumps. These pumps are ideally suited to assembly with electronic sample temperature controllers and installation in narrow spaces such as air-conditioning units. The pump and motor are connected by an adapter plate. For the basic type, liquid from the impeller flows back to the pump chamber through the FB housing, rotor chamber, and shaft to cool the motor and lubricate the bearings. 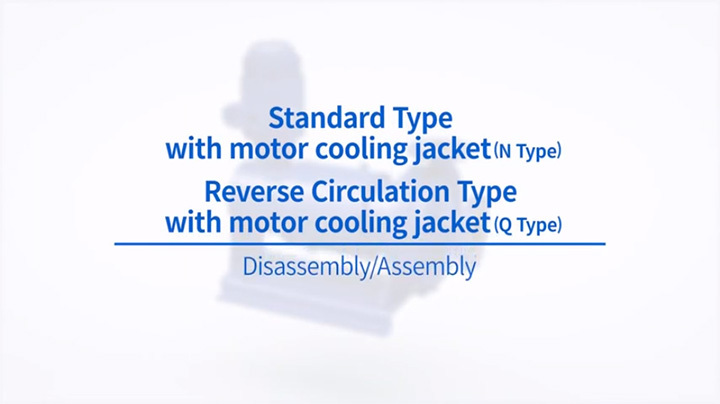 Transportation of high-temperature liquid is possible by attaching a jacket to the outer wall of the stator assembly to cool the motor depending on the temperature and property of the pumped liquid. The basic structure is the same as that of the basic type, but the return passage is wider to maintain the return flow of the liquid. 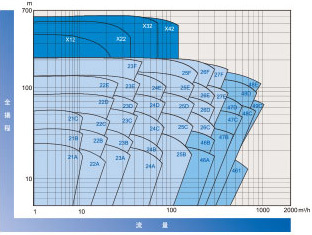 Well suited to transporting high-viscosity pumped liquid (80 to 200 mPa·s). This type of construction is designed to handle high-temperature liquid. The pump and motor are connected by an adapter. The adapter is constricted in the middle to separate the motor from the pump thermally by reducing the heat transfer to the motor. In the high-temperature type, circulation to cool the motor and lubricate the bearings is performed by the auxiliary impeller installed at the front of the rotor chamber independent from the main pump. A heat exchanger is provided to cool the motor and circulation liquid at the midpoint of the circulation tube. These types of construction are designed to handle high-temperature liquid without using any cooling water by utilizing special insulation materials. 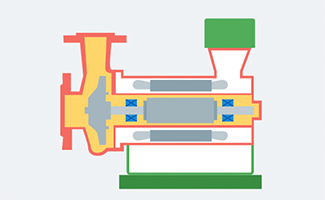 Requiring no cooling water, these pump types negate the need for cooling water piping. This frees operators from dealing with clogging and other problems, thereby reducing the costs including maintenance. 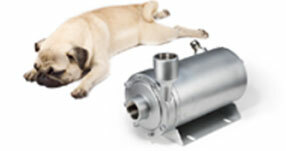 The pump is suited to heating liquids and transporting high-melting liquids that easily solidify. The basic construction is identical to that of the Type HT High Temperature Pump The motor for this pump has a design that prevents the entry of solids into the rotor chamber by injecting (back flushing) clean liquid or cleaning solution that is allowed to be mixed into the pumped liquid from the inlet connection provided at the rear of the motor. A back flushing line must be used with this pump. To reduce the amount of back flush fluid leakage into the process liquid, the slurry handling type with mechanical seal between the pump and motor (M Type) is available. 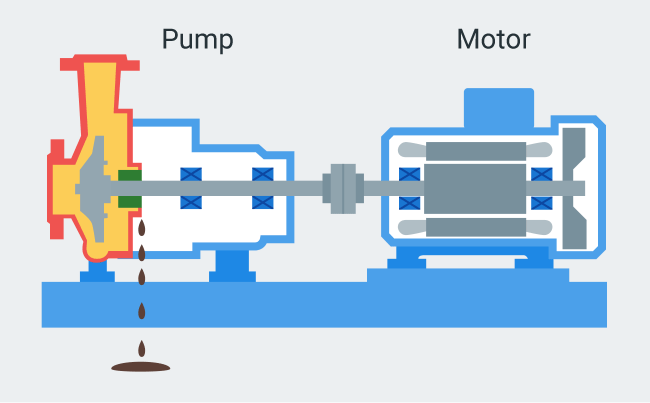 A mechanical seal separating the motor from the pump allows for a reduction in the amount of back flush fluid leaking into the process liquid from 100 to 500 mL/day. The gas seal type (G Type) is also available, suitable for handling highly corrosive liquids, liquids prone to polymerization and highly-concentrated slurry liquids. The pump basically has the same construction as that of the slurry handling type pump with mechanical seal, and it features a gas chamber between the pump and motor. The pump is completely separated from the motor by a gas chamber, which ends concern over wear and corrosion of the mechanical seal caused by the pumped liquid and ensures a long service life. Air or N2 gas is used as filler gas in the gas chamber (gas seal chamber). This pump has a construction suitable for handling liquid with a high solidifying (melting) point. This pump is provided with a heating jacket on the outer surface of the pump and the motor to prevent liquid from solidifying during liquid filling and during the pump operation. 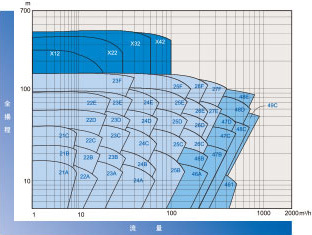 Depending on to the solidifying point of the liquid and the liquid temperature, a simple high melting point type (C Type) and a complete high melting point type (B Type) may be used. This type of pump has a structure suitable for handling saturated liquefied gas with high vapor pressure such as, ammonia, and propylene. The pump features a circulation line that does not form a closed circuit. To prevent vaporization and gas accumulation in the motor, the circulation liquid is discharged from the pump chamber impeller outlet and enters the FB housing and the rotor chamber, and then passes through the reverse circulation piping supplied by the customer before returning to the vapor zone in the suction tank, thereby forming a type of bypass piping. This pump is used for easy-to-vaporize liquids such as liquefied gas. The closed loop maintains a high pressure in the motor chamber, which eliminates the need to install reverse circulation piping, thereby reducing the initial cost. If you have any questions, contact us for more information. The basic construction is identical to that of the basic type pump and this type has been built to allow self-priming with no flap valve required. Since there is no flap valve, heavily corrosive liquid can also be handled and there is no possibility of poor self-priming due to clogging in the flap valve. This pump is used for high-head conditions. With the addition of a balance disc, the shaft thrust force is adjusted automatically and covers a wide range of flow rates. The pump is of compact construction that facilitates disassembly and assembly and allows for on-site maintenance. The pumps in this series are compliant to the API685 standard. The pumps are mainly used for severe conditions in petroleum refinery and petrochemical processes. These pumps are which have the same performance characteristics as the Standard Non-Seal® Pumps. The inverter control system allows for energy saving and wide flow range operation. These pumps are ideally suited for assembly with electronic sample temperature controllers and installation in narrow spaces such as air-conditioning units. The pumps in the JIT (just-in-time) series are available for immediate delivery. These pumps are mainly made of stainless steel and capable of handling a wide variety of pumped liquids. Ready for immediate off-the-shelf delivery in case of emergency.